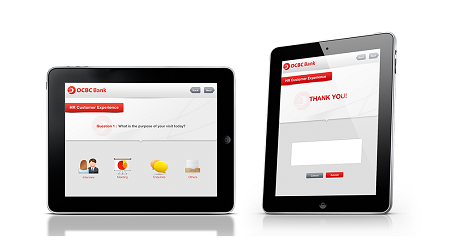 App Developer Malaysia : OCBC Bank can acquire important information's that OCBC Bank can use to enhance their administration through OBCB survey mobile app. OCBC Banking Survey Mobile Application is produced for OCBC Bank to acquire data in regards to their clients and representatives agreeable towards OCBC administrations. Questions - Client will be obliged to answer few basic inquiries focused around their motivation of visit to OCBC Bank. The inquiry will likewise be asked focused around guest or worker. In the event that the client is a representative, he/she will oblige the state their division. Clients are obliged to remark focused around the given agreeable level. Hidden feature - Through the OCBC Overview application, there is a shrouded peculiarity whereby if a client swipes the OCBC Bank logo 3 times, they will have the capacity to view number of client that have taken the review and exchange it once again to the primary server.